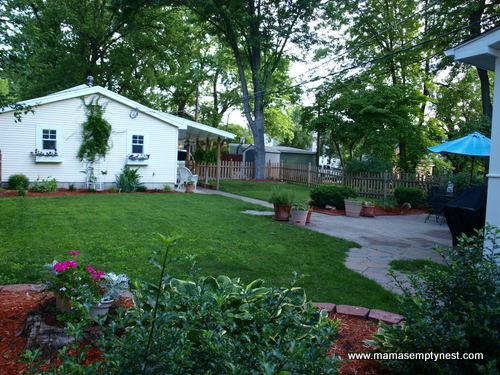 We moved from a home with a ½ acre yard to a new home with a much smaller yard. This was our old backyard. Hours and hours were spent on it each week. The steep hill in the back was a killer to mow. Especially since DSH insisted on this cross-cut pattern each cutting. He kept the lawn weed-free and well-fed. This meant it needed to be cut three times a week when the weather was not too hot. I, for one, thought we had better things on which to spend our time. This is our new backyard. Cute. But small and manageable. We had a contest the other night to see if I could clean up after dinner and wash dishes more quickly than DSH could cut the lawn. It was nearly a tie. 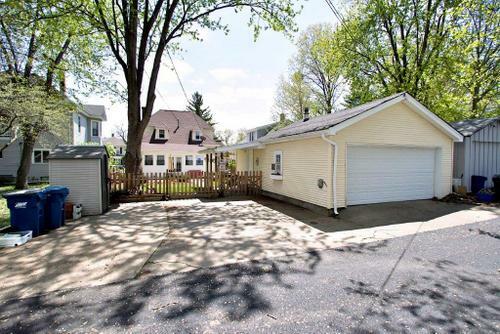 The previous owners had the backyard nicely landscaped. 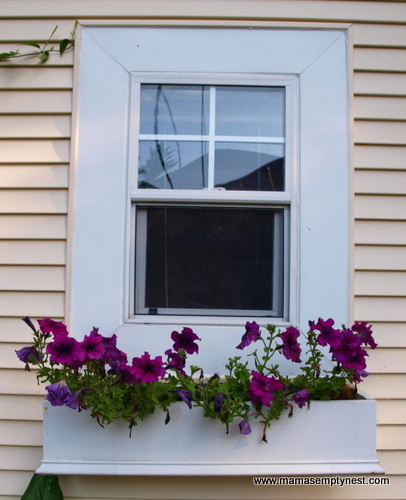 There are cute window boxes with petunias. 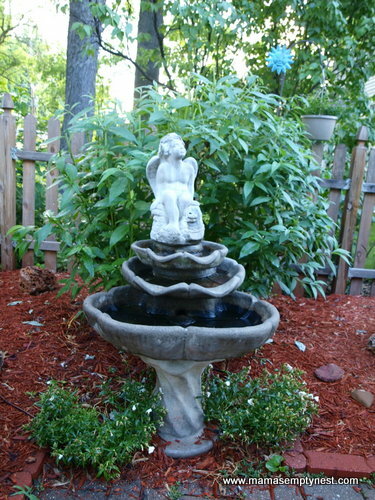 And an angel fountain with a butterfly bush. There is a trellis and some nice perennials and other plantings. But, I wanted to add my own touches. I knew that I wouldn’t be able to get a garden in this year and, quite honestly, the area is so overrun with squirrels and rabbits I don’t know that I would have harvested anything. They ate my geraniums already and have eaten a lot of the plants in the beds, too. 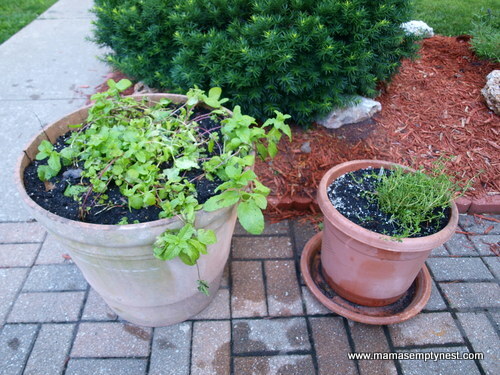 I did bring along some of my herbs which I wintered over in pots. I added some that I had to leave behind in the raised beds at the old house. 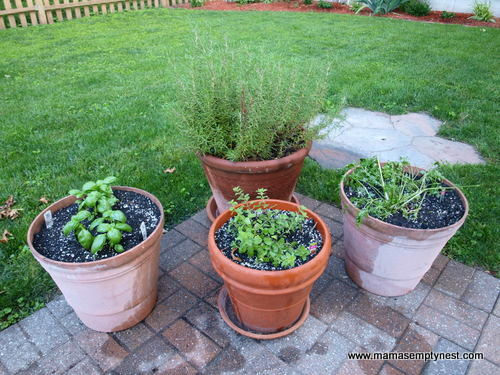 Rosemary, basil, oregano, and parsley. 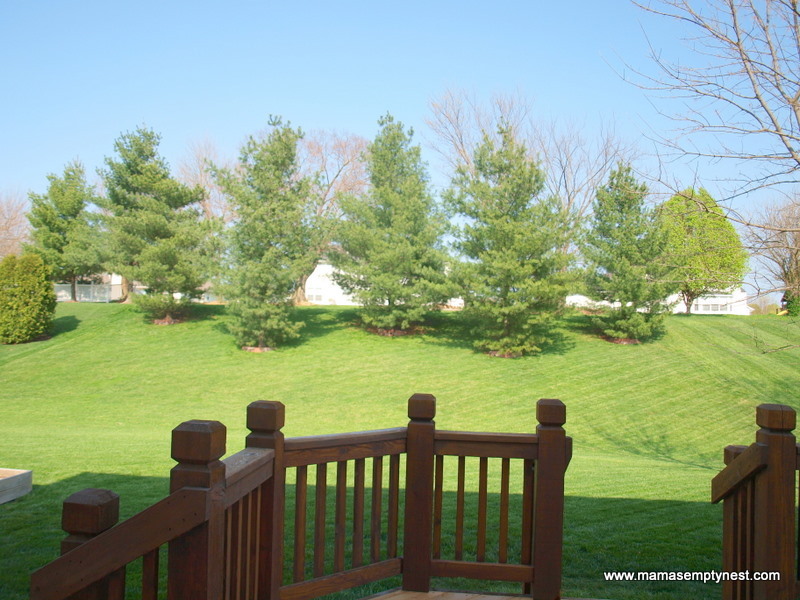 I’m not crazy about the yews, but we don’t have time to take them out this year. So I added a sage plant in a corner where it can eventually grow larger. My friend, Lynn, gave us the glass hummingbird feeder. 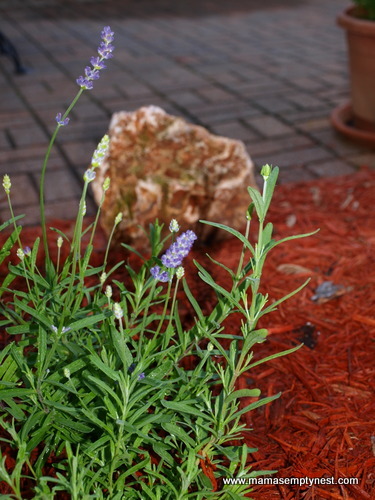 I added an English lavender plant in another spot where it can grow into a large bush someday, too. 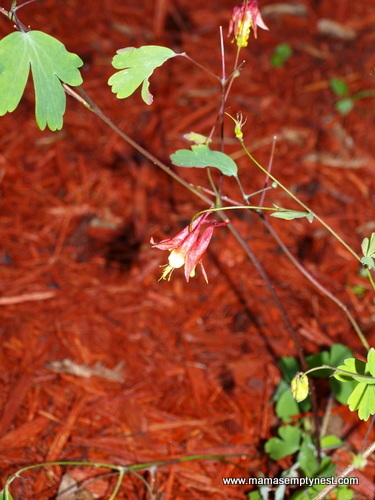 This is some columbine that my mother-in-law gave me from her garden. This cutting is from a vintage plant that originally came from her mother’s garden. So, this is a sentimental planting whose origins are much older than I am. How cool is that? We have this nice sitting area off the soon-to-be game room which is off the garage. 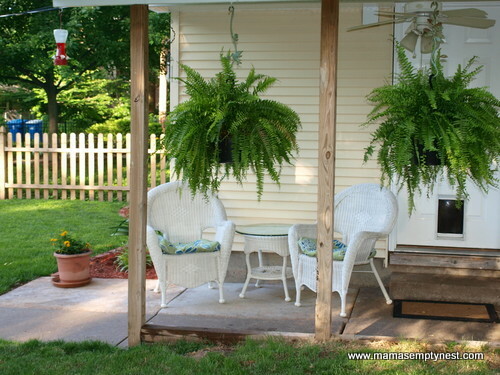 This space was begging for something like these large asparagus ferns. I added some other flowers and even a few jalapeño plants. 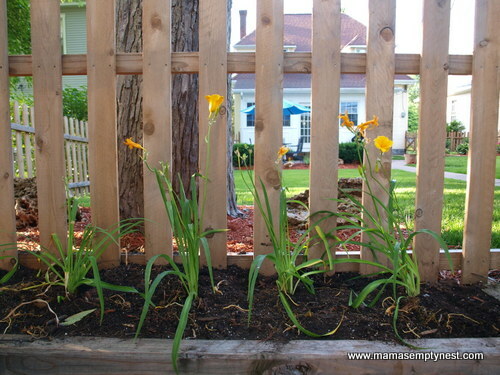 I found two root-bound Stella D’Oro Daylily plants on clearance at the local home improvement store, broke them apart, and planted them in this bed back by the garden shed and alley. We get some nice sun in the morning and the afternoon sun is blocked by the neighbor’s trees. 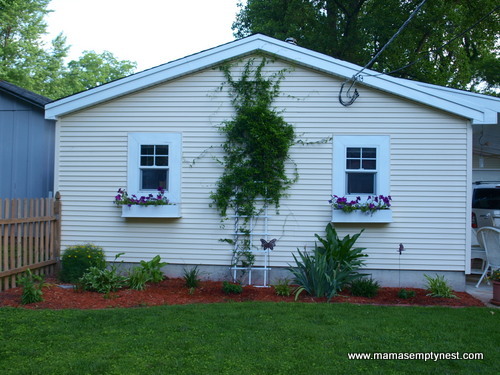 I think the back of the house is as cute as the front of the house. I love your additions!! The wicker looks great there and provides a great place to relax! I’m now researching ways to keep the squirrels out of my flower pots. They even got into the mint, and that is one of the home remedies to get rid of them is mint! Either that or I sweep up dirt each day. Sigh. Try moth balls. they worked for me in my flower pots. Yes, that is one suggestion I still have to try. I’ve been hesitant to use something potentially toxic in my herb pots which I use for cooking and baking. 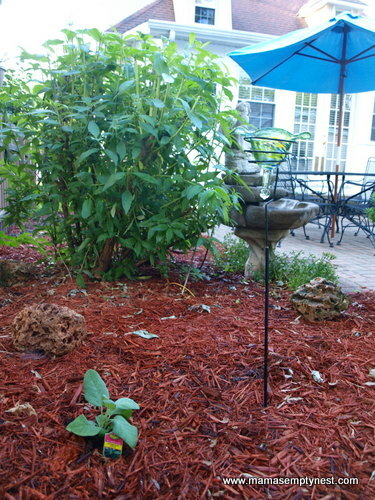 I am using the critter ridder stuff made of pepper and that helps – until it rains and you have to start all over again. Yikes. Theresa, have you ever grown Boxwood Basil? The leaves are so tiny they don’t have to be chopped to use them I planted it in containers last yea and agan this year. .
No, but my friend has – I love the regular large basil leaves and hope we have enough warm weather for it to really grow! I winter most of my herbs over in the winter and they come back year after year.